Do you Just Add Water? In 1986, mysterious signs advertising “improv comedy” went up all over campus. Following the directions of the signs, a group of intrigued students met in a classroom, where they found the words, “Do You Just Add Water?” written on a chalkboard. That fateful day, the seeds of comedic legacy were sown. The group’s founder, and the mysterious poster of those signs, was Steve Bodow, who is now the co-executive producer of The Daily Show with Trevor Noah, formerly co-executive producer of The Daily Show with Jon Stewart. Fellow founding member Jo Miller wrote for The Daily Show with John Stewart and was head writer and executive producer for Full Frontal with Samantha Bee. Other alumni have gone on to win Emmys, Golden Globes, and Tonys; work for Late Night with Seth Meyers, SNL and Stella; and even join President Obama’s Council of Economic Advisers, which could always use a few good laughs. Allison Williams, class of 2010, starred in HBO’s hit comedy, Girls, and the ground-breaking film, Get Out. Kobi Libii, class of 2007, is currently starring in Comedy Central's The Opposition w/ Jordan Keppler. We had a chance to hang out and improvise with some of our alums at our 30-year Just Add Water reunion, and they’re as hilarious as ever! 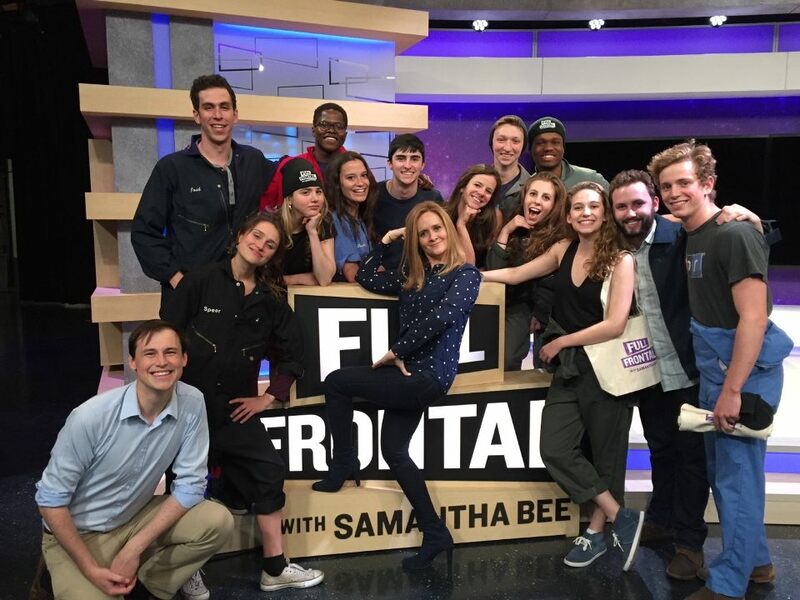 JAW COMES FULL CIRCLE: IN 2016, JAW PERFORMS ON THE SET OF FULL FRONTAL WITH SAMANTHA BEE, WHICH JAW FOUNDER JO MILLER CURRENTLY CO-EXECUTIVE PRODUCES AND CO-WRITES.